Sky has announced a new set top box, with the Sky+HD 2TB box arriving alongside an extended catch-up service from the company and the release of its iPad app. Although the main announcement from Sky will be around a catch-up service that will launch with its own programmes as well as those of ITV and Five and be extended to include BBC and Channel 4 shows, the new box could well prove popular. The 2TB version doubles the capacity of the previous flagship device, and will store up to 350 hours of HD television. "The Sky+HD 2TB box offers more personal storage than any other subscription TV provider, for example customers can record three times more high definition (HD) TV than with Virgin Media," stated Sky in a release. The satellite giant says that the box has been produced in 'response to customer demand' as its subscribers look to record more programmes in HD. 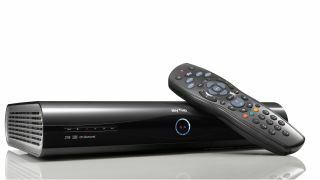 The 1TB box from Sky was launched back in 2010 and picked up huge plaudits, including a five star review from TechRadar.